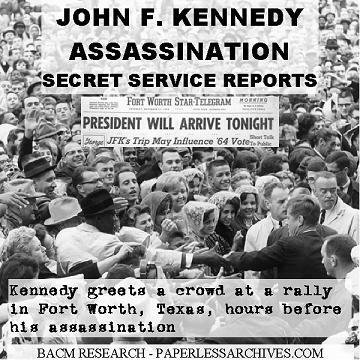 2,400 pages of investigative reports produced by the United States Secret Service in the days following the assassination of President Kennedy on November 22, 1963, copied from material held at the National Archives and Records Administration. The reports date from November 24, 1963 to October 24, 1964 and contain approximately 2,250 discernible pages. Materials in this set includes: A collection of reports on investigations by Secret Service agents on issues surrounding the assassination ranging from key fundamentals down to minutia. Reports dealing with aspects of President Kennedy's autopsy. Interviews of Marina Oswald. A report on the origins of the "Wanted for Treason" posters featuring President Kennedy distributed around Dallas. A copy of Lee Harvey Oswald's address book. A comprehensive report dated December 18, 1963 covers the protection in place at the time of the assassination and the events of November 22, 1963. The report is by Chief James J. Rowley of the United States Secret Service. The report emphasizes, "Presidential protection includes not only physical security measures against direct threats or attacks against the President, but protection against accidental and impersonal dangers inherent in Presidential travel and other activities. This responsibility must be carried out, however, in a manner that will not interfere unduly with the official activities of the President or with his personal life." Exhibits include: Tentative Itinerary for President's Visit on November 21 -22, Memorandum - PRS Activities in Relation to the Texas Trip and the Assassination of President Kennedy, Memorandum - Procedure for Handling Protective Research Information and Subjects, Scurrilous Circular, Map Showing Route of President's Motorcade in Dallas, Articles re President's Trip to Texas in Dallas Newspapers, Final Survey Report, dated November 30, of SA Lawson, Diagram and Photographs of the President's Car, Specifications of Bubbletop, Assignments of Agents in Motorcade, and Photographs of Elm and Houston Streets and Texas School Depository Building.